President Barack Obama unveiled an array of measures on Tuesday tightening control and enforcement of firearms in the U.S., using his presidential powers in the absence of legal changes he implored Congress to pass. Obama accused the gun lobby of taking Congress hostage, but said in a ceremony in the East Room, "they cannot hold America hostage." He insisted it was possible to uphold the Second Amendment while doing something to tackle the frequency of mass shootings in the U.S. that he said had become "the new normal." "I believe in the Second Amendment. No matter how many times people try to twist my words — I taught constitutional law, I know a little about this, I get it — but I also believe that we can find ways to reduce gun violence consistent with the Second Amendment. 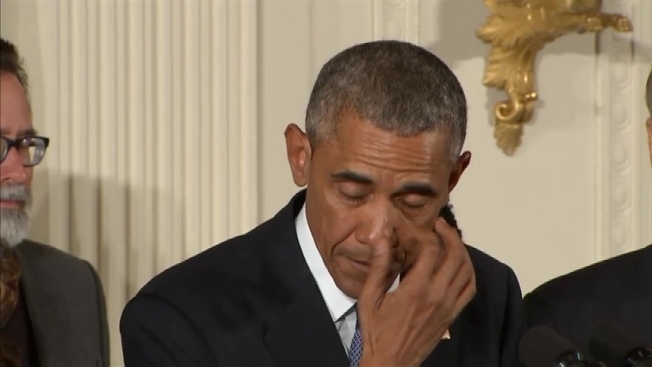 Obama wiped tears from his cheeks as he spoke emotionally about the victims of gun violence. At the centerpiece of Obama's plan is a more sweeping definition of gun dealers that the administration hopes will expand the number of sales subject to background checks. Under current law, only federally licensed gun dealers must conduct background checks on buyers. But at gun shows, websites and flea markets, sellers often skirt that requirement by declining to register as licensed dealers. Aiming to narrow that loophole, the Justice Department's Bureau of Alcohol, Tobacco, Firearms and Explosives is issuing updated guidance that says the government should deem anyone "in the business" of selling guns to be a dealer, regardless of where he or she sells the guns. To that end, the government will consider other factors, including how many guns a person sells, how frequently, and whether those guns are sold for a profit. The White House also put sellers on notice that the administration planned to strengthen enforcement — including deploying 230 new examiners the FBI will hire to process background checks. To lend a personal face to the issue of gun violence, the White House assembled a cross-section of Americans whose lives were altered by the nation's most searing recent gun tragedies, including former Rep. Gabrielle Giffords and relatives of victims from Charleston, S.C., at Virginia Tech. Mark Barden, whose son was shot to death at Sandy Hook Elementary School, introduced the president with a declaration that "we are better than this." Invoking the words of Martin Luther King Jr., Obama said, "We need to feel the fierce urgency of now." 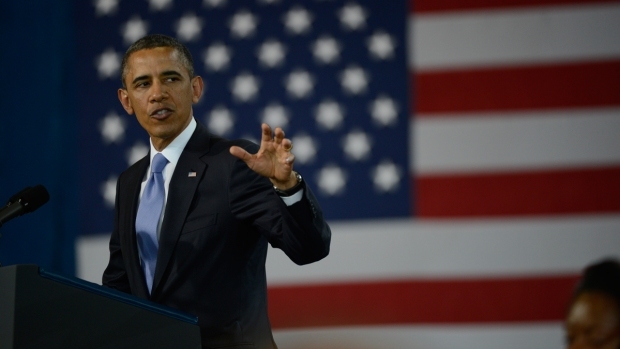 President Obama is expected to sign an executive order expanding federal background checks on gun purchases. He will meet with Attorney General Loretta Lynch Monday afternoon to talk about ways to increase background checks for people who buy guns. Obama's package of executive actions aims to curb what he's described as a scourge of gun violence in the U.S., punctuated by appalling mass shootings in Newtown, Connecticut; Charleston, South Carolina; and Tucson, Arizona, among many others. After Newtown, Obama sought far-reaching, bipartisan legislation that went beyond background checks. When the effort collapsed in the Senate, the White House said it was thoroughly researching the president's powers to identify every legal step he could take on his own. A more recent spate of gun-related atrocities, including in San Bernardino, California, shootings have spurred the administration to give the issue another look, as Obama seeks to make good on a policy issue that he's elevated time and again but has failed until now to advance. In response to Obama's proposed executive actions, Chris Cox, executive director of National Rifle Association's Institute for Legislative Action said in a statement, "Once again, President Obama has chosen to engage in political rhetoric instead of offering meaningful solutions to our nation’s pressing problems. Today’s event also represents an ongoing attempt to distract attention away from his lack of a coherent strategy to keep the American people safe from terrorist attacks." "The American people do not need more emotional, condescending lectures that are completely devoid of facts," the statement continued. "The men and women of the National Rifle Association take a back seat to no one when it comes to keeping our communities safe. But the fact is that President Obama’s proposals would not have prevented any of the horrific events he mentioned. The timing of this announcement, in the eighth and final year of his presidency, demonstrates not only political exploitation but a fundamental lack of seriousness."